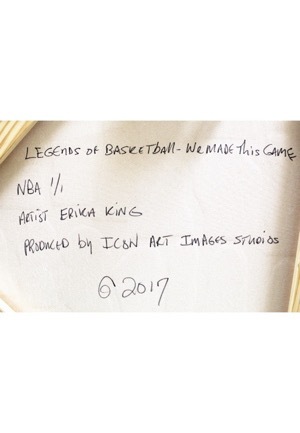 Created by renowned artist Erika King in 2017, this extraordinary piece features 60 of the greatest players ever to play in the NBA. 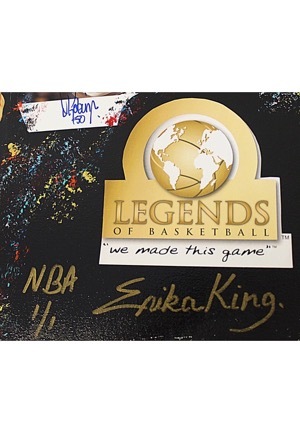 Measuring at 40x60", the canvas piece is stretched over a frame, while it is hand numbered at 1/1 on the back. 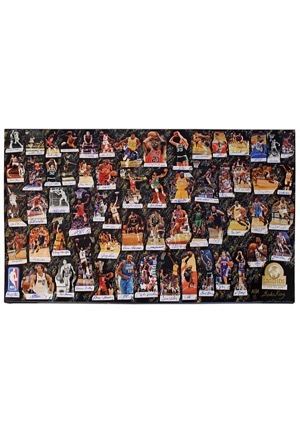 The signatures are highlighted by many of the original NBA's Top 50 including Dolph Schayes, Willis Reed, Elvin Hayes, Nate Thurmond, Hakeem Olajuwon, Magic Johnson, Michael Jordan, Larry Bird, John Stockton, Yao Ming, Jerry West and others. Also included are the modern stars such as, LeBron James, Shaquille O’Neal , Kobe Bryant, David Robinson, Allen Iverson, Dwyane Wade, Charles Barkley, Chris Paul, Steve Nash, Paul Pierce, Deron Williams, Kevin Garnett, Vince Carter, Jason Kidd, Dirk Nowitzki and many others. Accompanied by a LOA Icon Art and a JSA LOA.